Bayer CropScience faith in its engagement for continuous supply of innovative products and high level services organized two two-day events with informative and recreational character for its Collaborators in North and South Greece. 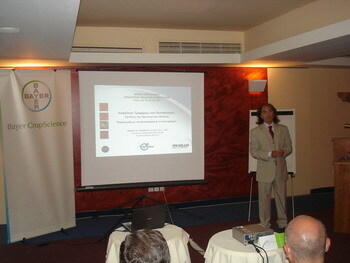 The two two –days events, were respectively organised in Xanthi (16 and 17 /6) and in Porto Heli- Spetses (30/6 and 1/7). The collaborators of Bayer CropScience had the chance to be informed for the needs of the Food Chain from Mr.D. Dionysopoulos and Mr. H. Christodoulakis of AB Vassilopoulos – Super Markets and for the last trends on the Certification in Agricultural sector by DKG’s Executive Director Mr. Christos D. Katsanos representing the AGRISYSTEMS Dept. of TUV HELLAS. Mrs Frantseska Ydraioy, Director of the HCPA (Hellenic Crop Protection Association), informed in depth the audience about the last developments in the European Legislation of Approvals of the Plant Protection Products, and for subjects related to the residues and MRLs of the PPP. On behalf of Bayer CropScience, a presentation about the Philosophy of the Company with regard to the Collaboration within the Food Chain and the case study of the table grape project in Kavala and Corinthus was presented. The next day, the Collaborators of Bayer CropScience left the work at part and enjoyed the adventure of canoeing the Nestos River in Xanthi, while in Spetses they were delivered in a fascinating Star War next to the wave! Those exceptionally achieved events were organised by Business Services of Marketing Department of Bayer CropScience.